March 19: Stop U.S./U.N. intervention against Libya! End U.S. wars! Stop U.S./U.N. military intervention against Libya! NO to the war abroad and NO to the war at home! Fight for Jobs & Education! Say 'No' to Racism! Go south from the station towards Whittier St. Tomorrow, Saturday, March 19, we will take to the streets of Boston as part of an international day of action against U.S. wars and occupations abroad and the war on working people at home. Demonstrations are happening in Washington, D.C., San Francisco, Los Angeles, Chicago and dozens of other cities. Click here for a list of demonstrations across the United states. The United Nations Security Council just approved a bombing war on the people of Libya, authorizing a no-fly zone that was pushed hard by the United States, along with its French and British allies. The resolution also authorizes “all necessary measures” against Libya. How dare the U.S. government even speak of “humanitarian intervention” when it openly supported the government of Egyptian dictator Hosni Mubarak for decades, continues to finance Israeli atrocities against the Palestinian people and is presently occupying both Iraq and Afghanistan? The U.S. government only takes action to forward its own strategic interests. This means the interests of Big Oil, Wall Street bankers and massive corporations. Working people gain nothing through U.S. wars and interventions. End U.S. wars — Bring the troops home now! U.S. military spending exceeds that of the rest of the world combined. U.S. wars in Iraq, Afghanistan and beyond have brought nothing but death and destruction for the victims of occupation as well as U.S. troops. Now, Washington is launching a military campaign against oil-rich Libya. U.S. out of the Middle East! No military intervention against Libya! Money for jobs, health care and education! While the Pentagon gets a blank check from the federal government and banks and corporations enjoy record profits following the taxpayer-funded bailout, working people are fending for themselves against persistent unemployment as their social programs are slashed. In Boston, the School Committee has voted to close 17 schools and has more cuts on the way — an overt attack on public school teachers and students. Stop the attacks on working people! Say NO to racism! Full rights for all immigrants! Gov. Deval Patrick has announced his intention to join the "Secure Communities" partnership between federal and local governments, a racial profiling program that targets working-class immigrant communities. The Boston police has been voluntarily participating in the program since 2006. We stand against "Secure Communities" and all other racist initiatives targeting immigrants. Stop racist police brutality! Police brutality and racial profiling continue to plague Black and Latino neighborhoods, yet 7 out of the 10 highest paid city employees are in the Boston police. Last year, Boston police made headlines by violently kicking and punching a 16-year-old teenager at Roxbury Community College while he was down on the ground. And yet, at a time when working people are facing cutback after cutback, more than $30 million were spent to build a state-of-the-art police station in Roxbury. Now more than ever it is clear that our movement must stay in the streets. On March 19, we will come together for a rally and march and say: "From Boston to Baghdad: End the Occupation! Fight for Jobs and Education! Say 'No' to Racism! Stop U.S./U.N. military intervention against Libya!" 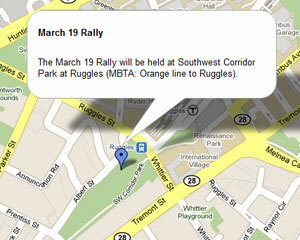 We need your help to make the March 19 Day of Action a success. Please make an urgently needed donation now. The March 19 action was initiated by ANSWER Boston. To see the original call to action and a list of organizations that endorsed the call to action, click here. To endorse the March 19th demonstration, click here.